Thus 2017 produces a top ten list of bottles hailing from well known climes including Champagne, California, and the heart of Spain's winemaking north, as well as off-the-beaten path destinations such as Moravia in the Czech Republic, southern Sweden, a volcanic island just off Africa's Atlantic coast, New York and Texas in the United States, and a tiny wine region south of Madrid. We hope you'll think of the wine you drink in similar ways, and that you seek out some of what we have to share. All are delicious. Our top ten wines of 2017 are listed below in the order we'd taste them in a lineup, not in a ranked order #1 through #10. This bottle was quite notable in our lives as it was our 1,000th bottle purchased (err, the 1000th bottle we've tracked) since Meghan and I combined our wine collections several years ago. We wanted to make it a special bottle, and saved it for quite some time before finding the right moment to drink. A complex nose of brioche (which is typical), honey, spindrift (that's spray blown from a rough sea or surf), and harbor mist gave way to a very smooth and fresh Champagne that featured bright acidity like biting into a fresh apple. It was, interestingly, not at all creamy, eschewing that quality for something a little more toasty and a touch nutty on the finish. It is thus a great food Champagne. We picked this out while tasting it with the winemaker himself, and offer it as a lesson on seeking out less mass market Champagnes. It's easy to get dragged into the bottles you see so often, the Veuve Clicquot or the Moët and Chandon of the world. We enjoy them too, but ask your wine purveyor to find you something new. Soft candlelight at Bokovka refracted beautifully through glasses of the Dobrá Vinice Crème de Parc National. Set aside some disagreement of the origin of this sparkling wine; the sommelier asserted it to be a blend of Welschriesling, Rhine Riesling, and Muller Thurgau, though some sources on the Internet claim otherwise. It's natural and unfiltered, thus making it stylistically very different for drinkers used to sparkling wine made in the Traditional Method for which (say) Champagne is known. That lack of filtration produces a beautiful, cloudy, shimmering gold color in the glass from whose center a lone seam of bubbles emanated. The nose is reminiscent of light cider, reminding us of what high quality producers like Pennsylvania's (USA) Big Hill Cider Works are doing now. It effervesces lightly in the mouth, again, a far cry from traditional method sparklers. Largely apple and subtle pear notes pair beautifully with the mouthfeel and entire visual experience to produce a glass that we'd drink again and again. I recently enjoyed this bottle with a good friend at the absolutely stunning Bokovka wine bar in Prague. Absolutely. Stunning. Yet, so intimate and casual. You'll note that their website bills the place as "A decrepit courtyard offering great wines." We have doubts about one's ability to get hands on a bottle of this in most parts of the world, but we offer it up as proof of two facts: (1) Great sparkling wine is made in wine regions of which you may not be familiar, and (2) The Traditional Method doesn't have a monopoly on great sparkling wine. Work with your local wine merchant to explore the doors that these two revelations will open for you. We tried our lineup of Klagshamn wines at a restaurant called Swedish Taste in Göteborg, and highly recommend! Sweden's winemaking community is tiny, constrained by cooler climate and fairly restrictive laws there concerning the sale and production of alcohol. So small, in fact, that Swedes themselves seem to laugh off the notion that the country would make wine at all, instead preferring wine from historic European producers such as France, Spain, and Italy. We think this is an oversight, and at least in Klagshamn have found wine similar in style and quality to the nice cool climate whites produced along the South Coast of Massachusetts in the United States, or more famously in New York. We'd love to see this wine exported such that we could get a bottle in the United States, and so that others around the world can share in our surprise and delight. Our favorite in the Klagshamn lineup, the Inkognito took home silver at the International Wine Challenge in 2017, so we were pleased to see that our newfound appreciation for Swedish wine is shared by at least some others. Pineapple, apricot, and the ever slightest essence of sweet frosting like what you'd find atop a cinnamon bun (we really mean slight… this is not a dessert wine by any stretch) leap from the nose in what feels like high notes on a piano. The palate carries on those pineapple and apricot notes alongside those of yellow apple and a little bit of cream. A wonderful white made from the Malvasía Volcánica variety, the grapes that produced this bottle are grown in a soil heavily comprised of volcanic ash on the island of Lanzarote, in Spain's Canary Islands. Located off the coast of southern Morocco, these islands are geographically part of Africa, making their wine truly unique in the pantheon of Spanish, European, and global winemaking. "Seco" wines, in Spanish wine parlance, are more dry. This offering from Bermejo carries qualities that find us thinking of both the Albariño and Verdejo grape varietals found elsewhere in Spain. The nose is almost effervescent, with a little grass and orange melon wafting up from the glass. There's a little acidity on the front (hey effervescence! ), but otherwise very smooth and round. The Malvasía grape is known for florality, and the flower notes popping out of this one are no exception. We've drank this bottle at restaurants both on Lanzarote and an Madrid, so we know it is very much available in the Spanish market. Try it at Triciclo on Calle de Moratin in the Letras neighborhood, next time you visit Madrid. We've not seen it in the United States, but we've been assured that Canarian wineries do export both there and throughout the EU, so we're hunting! Otherwise ask your local wine merchant to find you a quality Albariño with good acidity, or a quality Verdejo that isn't too grassy. They're not the same as the Malvasía Volcánica, but happen to be produced produced widely in Spain, and are widely exported abroad. Blindfold is one of our perennial favorites, drank on our anniversary after having kept it in a commemorative box given to us by Kathleen. From the same folks who bring you creepily-labeled "The Prisoner" red wine every autumn, Blindfold pours from a bottle featuring an equally creepy label. But it's so delicious! The nose manages to be woody, grassy, and floral (an odd trio), with some added buttered popcorn notes. It's extremely creamy and oaky, slightly grassy in the finish. The creaminess of the wine made this a beautiful pairing with the sharpness of manchego cheese. The plethora component grape varietals -- Chardonnay, Viognier, Roussanne, Marsanne, Grenache Blanc, Chenin Blanc, Semillon -- of this white blend are sourced from various vineyards in California, so we can't ascribe a single appellation (geography) to it. New Yorkers have easy access to a really nice lineup of fit-for-summertime rosé wine out on Long Island. We've had several recently that surprised and pleased us. If you're not NYC-local, though, we recommend you seize the moment to explore legitimate rosés that are available to you. Note, we're not talking about White Zinfandel. A true rosé is a wine made with great care from red grapes, giving you a touch of what you like about red wine, but cooling it down for warm weather consumption. We particularly love rosé made from Grenache / Garnacha, Pinot Noir, and Cabernet Franc grapes. Incidentally, you'll enjoy these all the way through Thanksgiving, and will enjoy them any time of year with pork for dinner. There are today few more visible advocates for Cab Franc than Lori and Michael Budd of Dracaena Wines. They've grown through amateur winemaking to producing several vintages of Paso Robles, California Cab Franc over the last several years, and have through social media tirelessly promoted not just their own grape, but the broader global wine community in general. Their 2013 vintage opens a bit astringently in the nose, but follows with notes of sandalwood, cocoa powder, cardamom, and a little nuttiness. It's much smoother than expected on the palate, whose lack of signature Cab Franc peppery notes is offset with touches of cigar smoke -- or, rather, the woody sensation in your mouth of burning wood in a fireplace or camp fire -- milk chocolate, and after about three hours to air in the glass, white tea and vanilla, like the custard from a crème brûlée. The 2013 vintage is ready to drink now, but the 2015 vintage is still on sale. Order some and have it shipped direct. We're confident you'll have no regrets. Drinking a glass of Arrayán. At Arrayán. We brought this bottle back from the Bodegas Arrayán winery in Méntrida, Spain, near the city of Toledo. Made from the small region's signature grape, this wine is lighter in color and not nearly as deep purple than what one might expect from a typical Garnacha. The nose leaps out of the glass with a unique herbaciousness -- oregano, to be specific -- creamy strawberry, and a bit of cocoa powder. It's delightfully smooth in the mouth, with lovely strawberry and raspberry notes, a creamy texture, and nice spiciness. There are some definite Pinot Noir qualities at play here that really distinguish this from Garnachas grown elsewhere in Spain. This was a really lovely bottle that we've sought out several times. 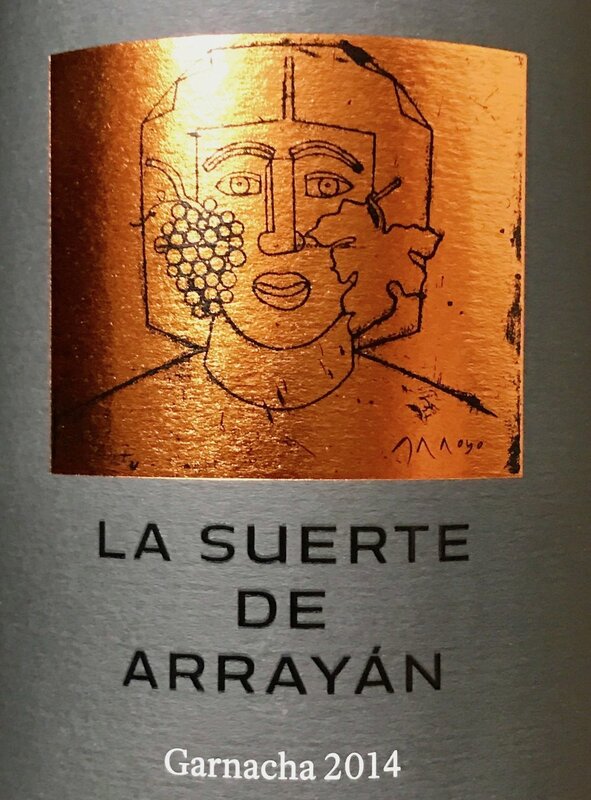 We've been seeing more and more of Arrayán's wine on shelves and wine lists in our hometown Arlington, VA - Washington, DC area, so we want to highlight them again as a unique yet very nice wine from a small region in Spain that is imminently getable in the United States. The urban terrain of one of 21st century America's most vibrant cities melted into rolling hills, a curious mix of green and grey driving west from Austin into the wine country of the Texas hills. Rain poured down, but the pastoral serenity of this place was as lovely as it was surprising to be found in a state conceptualized by many as an endless prairie of scorched earth and heat. We had come looking for Becker Vineyards, the next chapter in our long standing fascination with wine from places you'd not expect, and surely just the first chapter in our flirtation with wine from Texas Hill Country. Somehow the presence of Tempranillo in this lineup didn't surprise me, as I suspect this area produces a few similar climatic patterns as some of the world's great Tempranillo regions. Hot days, cool nights -- Toro, Spain -- anyone? We were told that 2013 was a bit of a dry year, which rings true from the very concentrated and robust red fruit notes we found in its vintage bottle. It's fruit-forward, yet also smokey, with a bit of spice reminiscent of a good Cabernet Franc wine. This was our favorite bottle in the Becker lineup (surprise, surprise). The flagship San Román has been a winner for Toro, taking in a well-deserved 95 point rating at #26 on Wine Spectator's Top 100 wines of 2016. You know this wine is big, bold, and beautiful from the very first brush. We found there to be rather alcoholic hot weather fruit notes in the nose, cherry, and just a touch smoky. Tongue coating tannins give way to velvety cherry, with a richly warm sense of cedar and smoke. Made exclusively from the Tinta de Toro grape (the local name for Tempranillo), this is one of the finest examples of wine from Toro that we have found. It's robust personality meeting Old World styling, the perfect cross over wine for those who enjoy the big New World reds. We recommend drinking San Román with food, particularly something cedar or hickory smoked. We paired this wine with one of the most incredible lunches we've ever had at a restaurant called El Chivo, just down the street from the winery in the town of Morales de Toro. It was brilliant with the chickpeas and calamari of the first course, and particularly so with the traditionally prepared lamb in the main course. San Román is exported and distributed worldwide.